Romantic and cozy cabin near Donner Lake set among the towering pines! Leave the hustle and bustle of the daily grind behind at this Donner Lake vacation rental. This cozy single bedroom cabin gives you the chance to unplug and recharge near the beauty of of the Eastern Sierra mountains. Just 17 miles north of the pristine waters of Lake Tahoe, you'll have the great outdoors are at your fingertips. Skiing, hiking, boating, and fishing are just a few of the options you'll have to explore as you let the stress from the city slip away. This A-frame style cabin welcomes you in with a single room, rustic style decor. The plush queen-size bed offers you the chance to rest after a long day of outdoor adventures. Kick your feet up on the expansive deck, just off the main living area. Here you'll be able to watch the gentle wind dance through the trees while you fire up the charcoal grill and dine under the stars. While a compact kitchen you'll have everything you'll need to whip up a delicious meal to give you energy for the next day's adventures. In the small upstairs loft, you'll find two twin-size beds, allowing a total of four vacationers to stay here comfortably. There's WiFi so you can check emails, or cuddle up with your special someone and enjoy the surroundings. The TV and DVD player allows you to set up a romantic movie night, or play a CD and fill the home with soft background music. Three blocks away, you'll find direct access to a boating dock that can launch your activities onto Lake Donner. During the winter Coldstream Adventures offer you the chance to book a snowmobile tour to explore the backcountry. A quick seven miles away you'll be able to hit the slopes at Sugar Bowl and Boreal Mountain resorts. Plan your next romantic getaway at this stunning North Lake Tahoe vacation rental and revel in nature. Note: the use of Tahoe Donner HOA facilities requires additional daily fees. Parking Notes: There are two driveways at this property. Please park on either one. Please do not park in the street especially in winter as you will be towed for obstruction of snow plows. Dock Details: Just a short walk to the north shore of Donner Lake where there are dozens of public piers free of charge. Water Access: Ten minute walk will put you on the shores of Donner Lake. Thanks for considering a Vacasa home! We provide full-service management for privately owned vacation homes, and like to think that we offer our guests the best of both worlds: the unique experience of staying in a one-of-a-kind vacation home, with the peace of mind that comes from knowing that the home you book for your special vacation is cared for by professional housekeepers and property managers. <br> <br> Vacasa began in 2009, simply because our founder and CEO Eric wanted to find a better way to share his wife’s family’s summer home in Long Beach, Washington with guests as a vacation rental. Eric and his early team worked to build Vacasa on the premise that local employees can do what they love most (taking care of guests, homeowners, and properties), while the hands-off tasks of vacation rental management�����things like marketing, filing taxes, and maintaining a website—could be handled by a specialized central support team. <br> <br> Our passion is connecting travelers with the unique experience of staying in a vacation home, and we would be honored to be your host. Please contact us with any questions about this home—our team is standing by! Upon arrival it was freezing in the house and it was discovered that the heater never turned on our entire stay. Thank God there were space heaters but they were constantly on and it never got warm in the house. Someone left us an empty bag of wood pellets for the wood burning stove, how thoughtful. Additionally, the lights upstairs never worked and the stove took at least 30 minutes to heat up making cooking a very long task. My son found several nails and staples primarily on the stairs and upstairs and injured his foot a few times. There were hardly any amenities in the kitchen and there is no oven. I have stayed at several homeaways but would say that this was my least favorite experience. More thought should be put into making this house "cozy". I was also asked to let them know of anything broken and I felt like I was an inspector as many things were not functioning properly. This may be an okay house to stay at in the summer but certainly not as it gets colder. I would also not pay more than $50.00 a night to stay here. It simply wasn't worth it. We have a new property manager at this home that has fixed all the lights. 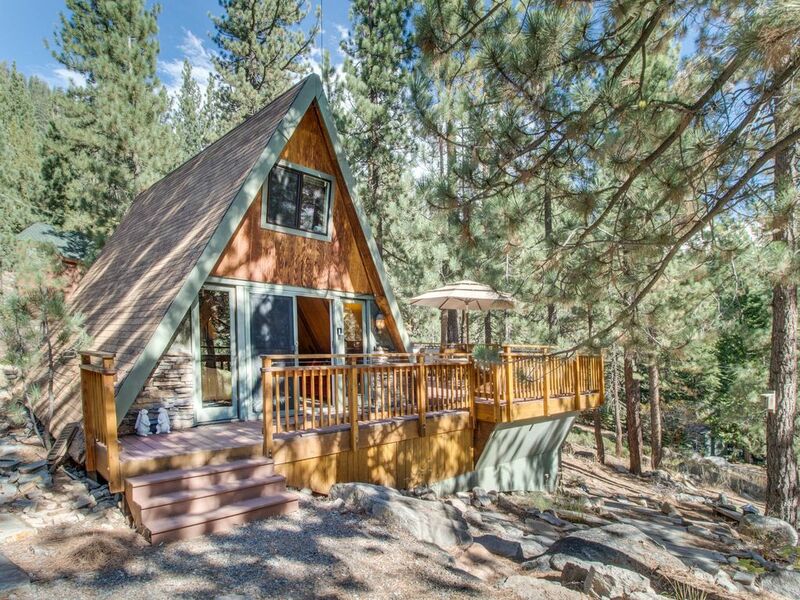 This is an original Tahoe cabin close to Donner Lake, and we love sharing it with our guests! The cabin was all we needed for our 3 day stay, but we had a lot of problems with the heater and blowing fuses, and they were difficult to use and no instructions were left! Also, we only had one roll of toilet paper.....which was a big deal when we ran out and didn’t realize there was no other rolls anywhere. We are sorry to see our guest had some difficulties with their stay and wish they had contacted us so we could assist them. The property manager is aware of these comments and will be addressing them. Thank you! It was very quiet place. Perfect for our needs not only super convenient to Truckee but also great for those who love nature. A short walk from Donner Lake and really close to the park. Ok. Where do I start? Good things listed first: 1) We are back home. 2) The deck was nice during the day (but not at night due to lack of lighting ). Now the not so good things: The cabin was not clean. The toilet had a ring of scum in the bowl, there were cobwebs in the corners, the kitchen smelled like dirty grease, the toss pillows were old and dusty, the bedspread looked dirty and had holes in it. The stairs are dangerous as they are very steep and without proper railing. Bring you own electronic entertainment as the DVD, TV, stereo did not work. Did not find a microwave but admittedly I did not open the cabinets because I was too creeped out at the overall condition of the cabin. I can deal with all that BUT the absolute deal breaker was the lack of a working shower. Yes, there are two shower heads (one is at knee height) but the water is lukewarm to downright cold, and more importantly, it comes out as a trickle at best, making it extremely difficult to get clean, and downright impossible to wash and rinse even the shortest hair. We would have been much better off going camping since campgrounds usually at least have working showers. We could not wait to come home and that's a shame! Have stayed at other cabins before and not impress with this one. It’s ok.
What a cute cabin for a weekend away with the family! We stayed over Memorial Day weekend and it was cozy and quaint. 10 minutes from historic downtown Truckee. The house was clean and comfortable too! The little loft makes it perfect if you have little ones. The deck is a great assest and we drank our coffee and ate meals outside! This is a steal!